With a long thin, narrow, flexible blade and rounded tip, this knife is designed to quickly and precisely cut small paper thin slices. 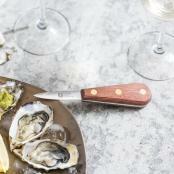 Along with its comfortable handle, the perfect blade length allows for a smooth efficient slicing action. This slicer is perfect for cooked or smoked meats, poultry and fish. Tailored to many textures, the blade works beautifully with the firmer fleshed meats – ham, prosciutto and dry sausage. Slicing cold meats is a breeze. The blade is precision ground, hand edged and honed resulting in a superior, long-lasting razor sharp cutting edge. 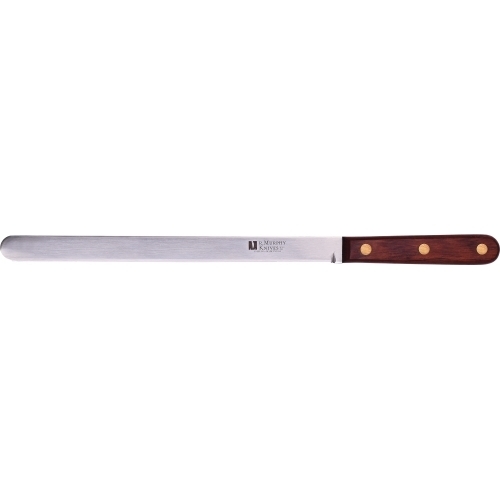 Full tang is triple brass riveted to the handle, providing strength, perfect weight and balance. Contoured handle is hand polished and designed for comfort. Stabilized Honduran Rosewood, a tropical hardwood known for its beauty and durability, contains natural oils that resist wet environments. Cryogenically treated blade substantially increases edge retention. Hand wash and dry after each use. Put away dry to prevent rust. As you use your carbon steel knives they will develop a pearlescent patina that will help protect it from rust and stains. To remove any blade stains, lightly scrub with steel wool and household cleanser, such as Bar Keepers Friend.